Gulf Breeze Firearms was started in 1986 by Duke McCaa and is now run by Duke and his son, Duke "L.D." McCaa II. They are the United States' largest Dakota Arms dealer and they have been located in the panhandle of Florida for the last 25 years. 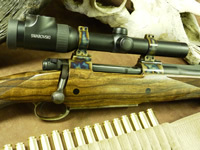 Gulf Breeze Firearms has always been known for selling high quality firearms, but has a special interest in custom big game hunting rifles and high quality shotguns. Both Duke and L.D. 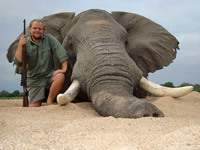 have multiple African safaris and big game hunts under their belts and know the importance of having the best, most reliable gear. It is with this working knowledge, that Gulf Breeze Firearms offers the best guns, optics and ammo for your next hunting adventure. We represent, recommend and sell the following brands: Dakota Arms, Cooper Firearms of Montana, Turnbull Manufacturing, Swarovski Optic, Barnes Bullets and Ammunition, Randall Made Knives, Badlands Packs, Boyt Harness and Mud River Dog Products. Duke and L.D. 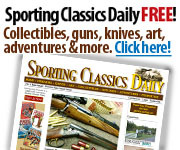 's knowledge does not stop with just hunting, or with their 50 years of collective experience in the gun business, they also handle estates involving guns and trophy animals and are certified appraisers and SCI measurers. Gulf Breeze Firearms is a recognized authority in the firearms industry and can offer our expertise in managing a firearms investment portfolio as well as the appraisal and/or sale of firearms, trophy animals and outdoor sporting collectibles. Through their experiences and travel, Duke and L.D. have forged many lasting relationships with outfitters and professional hunters and now Gulf Breeze Firearms represents and hosts hunts for some of the United States and Africa's best hunting companies and lodges. This father and son team realize the needs of the hunter, hunting in their own state or abroad, and offer a wide range of services and accessories to aid the traveling hunter. 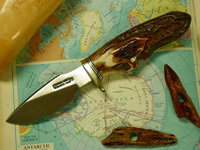 In addition to being purveyors of fine firearms and setting up hunts around the world, Gulf Breeze Firearms also sells handmade hunting knives, handmade furniture and home decor made from game hides as well as curios and accoutrements for the discriminating, sophisticated hunter and outdoorsman.